Music, dance and dine like there’s no tomorrow! 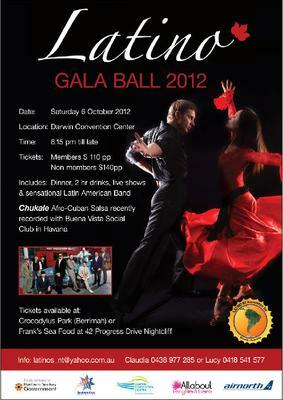 Spectacular band Afro-Cuban Salsa “Chukale” will be showcasing the cream of Latin American talent. Legendary Cuban Buena Vista Social Club lead singer Felix Baloy recorded with the band in Havana (Cuba) recently. Cameo performances include Tango from Argentina, Flamenco from Spain, Salsa and Merengue from the Caribbean, Mariachis from Mexico and much more. Package includes: Dinner, 2 hour drinks, live Latin shows, sensational Latin American band and the occasion of the year to dance and have fun all night long. culture. You can purchase your tickets by filling in the attached form or buying direct at Crocodylus Park (Berrimah) or Frank’s Sea Food (Nightcliff). This event will be truly fantastic. If you are planning a corporate Christmas Party … this is the greatest opportunity!